1 What is “One pole tent (Mono pole tent)”? 2 What is good point of One pole tent? 2.2 2. One pole tent is easy to set up if you get used to it! 2.3 3. One pole tent is cute! and fashionably! 3 What is badpoint of One pole tent? 3.1 1. One pole tent has dead space. 3.2 2. One pole tent cannot build according to the state of the ground. 3.3 3. One pole tent is not easy to fold. What is “One pole tent (Mono pole tent)”? 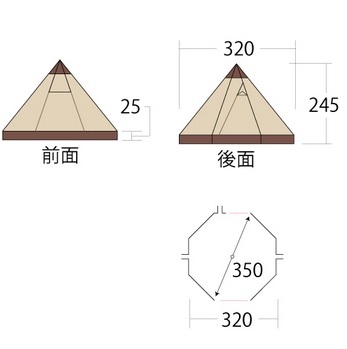 Have you seen the tent such as pointy hat? That is “One pole tent (Mono pole tent)”!! It is also called “Tipi tent” because it resembles an Indiean mobile residence. To stand a pole in the center of tent and hang the tent from the pole when you build the tent. Is it exciting like a big circus tent or Mongolian ethnic house “Gel (Pao)”? The good point of camping is to be able to feel extraordinary daily life. You might experience a different camping if you use a One pole tent. What is good point of One pole tent? Compared with the dome tent, there are many types with high ceiling, and there is sense of freedom. So you can feel a non daily feeling to use it. In addition, almost of one pole tents are nearly circular, you can feel different something from the square room. Maybe we don’t have chance to stay in the whole room. It is best to talk with your friends when you make a circle and to sit down. 2. One pole tent is easy to set up if you get used to it! As its name suggests, the pale is just one and the structure is simple, you can easily set up if you get used to it. But this setting method is different from ordinary tent. So at first, you may be a little confused. And depending on the environment, it may be difficult the installation and the withdrawal. So if you try camping for the first time, the Dome tent is good. 3. One pole tent is cute! and fashionably! One pole tent looks cute and fashionable! And it is spotlight and your mood is higher and higher. Almost tents are made by cotton or poly cotton fabrics. the atosphere is outstanding in the camping garden. What is badpoint of One pole tent? 1. One pole tent has dead space. Round type of tent makes dead spase the inside. If it is a type that a perfect triangle when seen from the side, it tends to be a dead space. So even the same floor area, the sleeping people are fewer than dome tent. When you select the tent by the size, to write a square in the floor area of tent and think about how many people can sleep in it. For example, “Piltz9-DX” by Ogawa campal. The diameter is about from 3.2m to 3.5m and it comfortable to use it by 4 person. 2. One pole tent cannot build according to the state of the ground. The one pole tent hangs the tent from center pole, but it does not extend without some pegs. And you cannot fix the pole without ropes and pegs. If the ground is hard or it is full of stones, the peg can not through the ground. On the contrary, in sandy areas, even if the pegs cannot be securely fixed, it will not be build on the area. At first, you have to search about the ground condition. In comparison, the dome tent can be self-reliance. So it is safe for beginners. 3. One pole tent is not easy to fold. One pole tent is made of one big fly sheet. So it is tough to fold. The pole is just one, so it is easy to put away. The tent that uses materials such as cotton and poly cotton (T / C) to make strength and texture. So it is heavy, and it will be more difficult to fold if the weather is rainy. 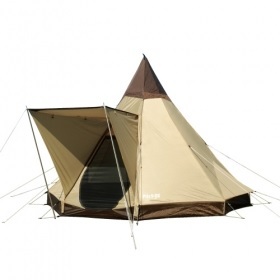 How do you feel about “One pole tent”? One pole tent is good tent that you can be enjoyed extraordinarily, but the performance depends on the ground and the weather condition.